January 2018 | InChem Corp.
InChem has invested in significant laboratory upgrades for purposes of focused efforts on customer responsiveness and satisfaction. 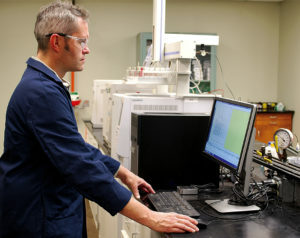 Its Quality Control (QC) laboratory at its Rock Hill plant has expanded state-of-the-art equipment and new personnel. The lab, located on the upper floor of the West Plant building, also serves QC needs of the nearby Charlotte plant. A new Headspace GC, a gas chromatograph with greater capabilities to analyze a sample by incubating it, letting liquid evaporate into the headspace. This allows for lower limits of detection, especially helpful with highly volatile compounds. A new Karl Fischer Metrotron, which provides moisture analysis and water content analysis. What are Chemical Manufacturing Companies and How Do They Work? Website Design By Lawrimore Inc.